This review first appeared in the July 2016 issue of high-end hifi magazine fairaudio.de of Germany. You can also read this Ichos Schallwandler review in its original German version. We publish its English translation in a mutual syndication arrangement with the publishers. As is customary for our own reviews, the writer's signature at review's end shows an e-mail address should you have questions or wish to send feedback. All images contained in this review are the property of fairaudio or Ichos - Ed. Viennese vroom. Our story begins last November, at the Vienna Sound & Images show. To my ears, one system really showed off with a high degree of presence, transparency and musicality. There was an analogue source on it and a finely finished Chinese-made 300B integrated from Austrian brand Wasami. All this ended in a pair of big-boy floorstanders called flatly the Ichos N°One. With its 15-inch fullrangers, bass was fully grown up even under hampering show conditions. This led to a lengthy chat with Rober Rothleitner, affable boss and designer of Vienna's Ichos Schallwandler (Ichos = Greek for sound, Schallwandler = German for sound transducer) which in due course led to today's assignment. The man didn't think my 24m² crib was properly palatial for his €12'000 model which I'd heard at the show. His choice was the next one down. That still flaunts a 30cm/11.8" widebander and on construction concept copies the bigger N°One. Whilst fiscal commitment drops to €7'998/pr, performance for my smaller room, or so I was promised, would give up nothing to the bigger sistah. Part of the work hours of our professional machine-shop engineer go to developing then booting up bio-gas plants, with spare time dedicated to his speaker building passion. That began during school days when, more forced than willingly, he supplied fellow students with DIY boxes. We all know how that ended and aren't surprised to learn that today, speaker manufacture has become Robert's official second profession. Adjacent to his office, he recently set up a dedicated listening room. Here he makes/takes time to mature his acoustic offspring or spontaneously tries out wild new ideas. By now he can look back on 30 years of speaker building to appreciate that it's far from essential to do everything himself. He instead prefers to rely on the support network of dedicated specialists when it comes to the drivers and enclosures. Voicing and design decisions are obviously arrived at in situ. Our Ichos man demands that his speakers be easy loads to make for exciting opportunities with often not costly or very powerful but sonically terrific amplifiers. That these can flaunt valves seems implicit. Logically then, his models play the trump cards of high efficiency and high impedance. Our N°Two tester calls that proudly 99dB/W/m and 8Ω. The latter doesn't cross below 6Ω and that 'low point' occurs at 4'500Hz where amps don't struggle. Hence 300B amps as heard in Vienna really are very viable candidates. To Mr. Ichos, crossovers are sonic brakes. They step on musical energy and dynamics. That belief naturally led to widebanders which, to make proper bass, had to be of sufficient diameters. For the 120cm tall N°Two, that meant a 30cm hard-hung paper membrane. Resonances across its 28 – 7'500Hz bandwidth are addressed with damping spots glued to the diaphragm which itself is literally baked in an oven with four layers of different lacquers. Aside from its suppression of breakup modes, this extensive hand-applied treatment is claimed to increase the driver's life expectancy. And instead of a typical iron ring magnet, this one gets 'flower power' neodymiums à la Focal. These drivers hand-made to Rothleitner's specs are sourced from a German supplier with whom he enjoys a lengthy collaborative partnership. Loaded into a floor-firing back-loaded horn, these widebanders maintain good efficiency into descending frequencies. The quite tall massive spikes determine the floor gap which, in conjunction with room size, determines the effective bass cut-off. For floors without stable support like plush carpets, Ichos offer bases in wood or granite. 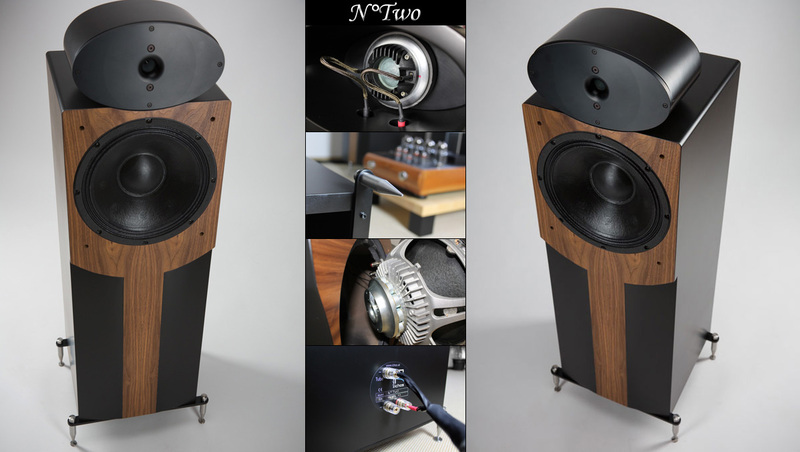 Under copasetic conditions, the N°Two promises heavy action from 30Hz – 23kHz. Whilst that's sufficient depth mining, our large widebander can't be expected to hit the high notes without getting hoarse. Enter a 25mm compression tweeter which Robert modifies from another German vendor, then loads into its own open-backed chamber for dipole dispersion. This radiates sound front and back to promise an airier more spatial presentation. Of course it also requires more setup time since front-wall reflections impact the end result. Alas, here's it's merely 7'000Hz+ coverage that does it dipole. And whilst the Titanium dome vents backward, its separate enclosure stretches 20cm to either side to minimize setup conniptions. At least in my room, I had no fussiness or audible treble issues. To protect against LF overload, a high-pass cap protects the tweeter, naturally an ultra-fast discharge type that commands a quick €70/ea.